Eukaryota is one of the three domains of life contianing organisms whose cells contain complex structures enclosed within complex membranes call endomembranes. These organisms are called Eukaryotes and are either singular- or multiple-celled. 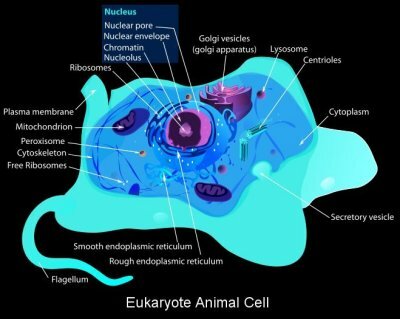 The defining membrane-bound structure that differentiates eukaryotic cells from prokaryotic cells is the cell nucleus, within which the genetic material and many other cell bodies are contained. 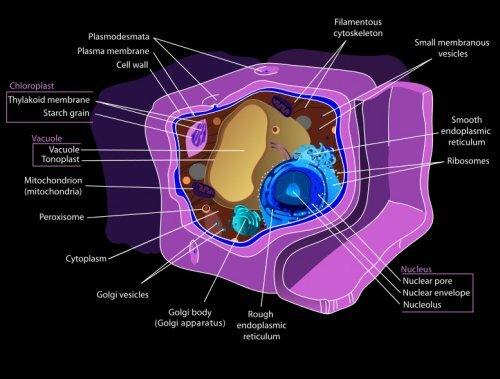 The presence of a nucleus gives eukaryotes their name that derives from the Greek (eu, "good") and (karyon, "kernel"). Most eukaryotic cells also contain other membrane-bound organelles such as mitochondria, chloroplasts and the Golgi apparatus. All species of large complex organisms are eukaryotes, including animals, plants and fungi, although most species of eukaryote are protist microorganisms. Domain Eukaryota is taxonomically devided into seven kingdoms. Cell division in eukaryotes is different from prokaryotes that lack a nucleus. It involves separating the duplicated chromosomes, through movements directed by microtubules. There are two types of division processes. In mitosis, one cell divides to produce two genetically identical cells. In meiosis, which is required in sexual reproduction, one diploid cell (having two instances of each chromosome, one from each parent) undergoes recombination of each pair of parental chromosomes, and then two stages of cell division, resulting in four haploid cells (gametes). Each gamete has just one complement of chromosomes, each a unique mix of the corresponding pair of parental chromosomes. Eukaryotes appear to be monophyletic, comprising one of the three domains of life; Bacteria and Archaea are prokaryotes that have none of the characteristics. Eukaryotes represent a tiny minority of all living things. It could well be said that the eukaryotes are guests in a prokaryotic world. For example, a human body contains 10 fold more prokaryotes than eukaryotic human cells. Eukaryote and prokaryote biomass on earth is approximately equal. The earliest fossil evidence of animals dates from the Vendian Period (650 to 544 million years ago), with coelenterate-type animals that left traces of their soft bodies in shallow-water sediments. The first mass extinction ended that period, but during the Cambrian Period which followed, an explosion of new forms began the evolutionary radiation that produced most of the major groups, or phyla, known today. Animals are a major group of multicellular, eukaryotic organisms of the Kingdom Animalia or Metazoa. Their body plan eventually becomes fixed as they develop, although some undergo a process of metamorphosis later on in their life. Most animals are motile, meaning they can move spontaneously and independently. All animals are also heterotrophs, i.e., they eat other organisms or their byproducts for sustenance. Most known animal phyla appeared in the fossil record as marine species during the Cambrian Explosion, some 542 million years ago. Plants are eukaryotic organisms belonging to the Kingdom Plantae. Plants comprise familiar organisms such as trees, flowers, herbs, bushes, grasses, vines, ferns, mosses, and green algae. They obtain most of their energy from sunlight via photosynthesis using chlorophyll contained in chloroplasts, which gives them their green color. Some plants are parasitic and may not produce normal amounts chlorophyll or photosynthesize. Evidence suggests that an algal scum formed on the land 1,200 million years ago, but it was not until the Ordovician Period, around 450 million years ago, that land plants appeared. Kingdom Fungi A fungus is a member of a large group of eukaryotic organisms that includes microorganisms such as yeasts and molds as well as the more familiar mushrooms. These organisms are classified as a kingdom, Fungi, which is separate from plants, animals, and bacteria. One major difference is that fungal cells have cell walls that contain chitin, unlike the cell walls of plants that contain cellulose. These and other differences show that the fungi form a single group of related organisms, named the Eumycota (true fungi or Eumycetes), that share a common ancestor (a monophyletic group). This fungal group is distinct from the structurally similar myxomycetes (slime molds) and oomycetes (water molds). In contrast to plants and animals, the early fossil record of the fungi is sparse. 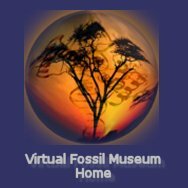 Factors that likely contribute to the under-representation of fungal species among fossils include the nature of fungal fruiting bodies that are soft, fleshy, and easily degradable tissues and the morphological nature of fungi that are difficult to distinguish from those of other microbes. Kingdom Chromalveolata Chromalveolata is a eukaryote supergroup first proposed by Thomas Cavalier-Smith in 1981 as a refinement to Kingdom Chromista. Historically, many chromalveolates were considered plants, because of their cell walls, photosynthetic ability, and in some cases their morphological resemblance to the land plants (the Embryophyta). Chromalveolata was proposed to represent the result of a single secondary endosymbiosis between a line descending from a bikont and a red alga that became the progenitor of chlorophyll C containing plastids. In a major classification produced in 2005, Chromalveolata was regarded as one of the six major groups within the eukaryotes, a phylogeny that has been challenged. Kingdom Rhizaria The Rhizaria are a species-rich supergroup of unicellular eukaryotes. This supergroup was proposed by Cavalier-Smith in 2002. They vary considerably in form, but for the most part they are amoeboids with filose, reticulose, or microtubule-supported pseudopods. Many produce shells or skeletons, which may be quite complex in structure, and these make up the vast majority of protozoan fossils. Nearly all have mitochondria with tubular cristae. Historically, many rhizarians were considered animals, with their motility and heterotrophy as justification. However, when the five-kingdom system took prevalence over the animal-plant dichotomy, the rhizarians were put into the kingdom Protista. Then, after Woese published his three-domain system, because of the paraphyly of the Kingdom Monera, taxonomists turned their attention to the eukaryote domain, and the inherent paraphyly of Protista. After much debate, which continues to this day, Rhizaria emerged as a monophyletic group. Kingdom	Excavata The excavates are a major kingdom of unicellular eukaryotes, The phylogenetic category Excavata that was erected by Cavalier-Smith in 2002 contains a variety of free-living and symbiotic forms, and also includes some important parasites of humans. Many excavates lack typical mitochondria, although most retain a mitochondrial-like organelle.. Most excavates have two, four, or more flagella and many have a conspicuous ventral feeding groove with a characteristic ultrastructure, supported by microtubules. Still others that lack these traits are considered excavates based on genetic evidence from molecular sequencing. The closest that the excavates come to multicellularity are the Acrasidae slime molds. Like other cellular slime molds, they live most of their life as single cells, but will sometimes assemble into a larger cluster. Excavate relationships are still uncertain, and it is possible that they are not a monophyletic group. Certain excavates are often considered among the most primitive eukaryotes. Kingdom Amoebozoa The Amoebozoa are a major group of amoeboid protozoa, including the majority that move by means of internal cytoplasmic flow. Their pseudopodia are characteristically blunt and finger-like, called lobopodia. Most are unicellular, and are common in soils and aquatic habitats, with some found as symbiotes of other organisms, including several pathogens. Vase-shaped microfossils (VSMs) discovered around the world show that amoebozoans have existed since the Neoproterozoic Era. The fossil species Melanocyrillium hexodiadema, Palaeoarcella athanata, and Hemisphaeriella ornata come from rocks 750 million years old. All three VSMs share a hemispherical shape, invaginated aperture, and regular indentations, that strongly resemble modern arcellinids, which are shell-bearing amoeboids. P. athanata in particular looks the same as the extant genus Arcella. Eukaryotic cells are typically much larger than those of prokaryotes. Eukaryotic cells also contain many internal membrane-bound structures called organelles. These organelles such as the mitochondrion or chloroplast serve to perform metabolic functions and energy conversion. Other organelles like intracellular filaments provide structural support and cellular motility. Eukaryotic DNA is divided into several linear bundles called chromosomes that are separated by a microtubular spindle during nuclear division. Eukaryote cells include a variety of membrane-bound structures. Many cells ingest food and other materials through a process of endocytosis, where the outer membrane invaginates and then pinches off to form a vesicle. It is probable that most other membrane-bound organelles are ultimately derived from such vesicles. 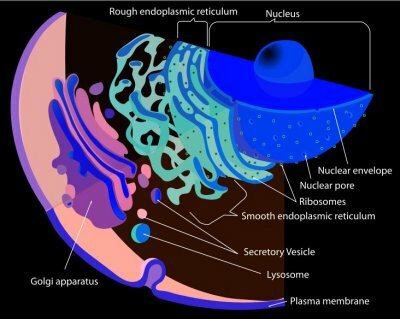 The nucleus is surrounded by a double membrane (commonly referred to as a nuclear envelope), with pores that allow material to move in and out. Various tube- and sheet-like extensions of the nuclear membrane form what is called the endoplasmic reticulum or ER, which is involved in protein transport and maturation. It includes the rough ER where ribosomes are attached to synthesize proteins, which enter the interior space or lumen. Subsequently, they generally enter vesicles, which bud off from the smooth ER. In most eukaryotes, these protein-carrying vesicles are released and further modified in stacks of flattened vesicles, called Golgi bodies or dictyosomes. Mitochondria are organelles found in nearly all eukaryotes. They are surrounded by two membranes (each a phospholipid bi-layer), the inner of which is folded into invaginations called cristae, where aerobic respiration takes place. Mitochondria contain their own DNA. They are now generally held to have developed from endosymbiotic prokaryotes, probably proteobacteria. The few protozoa that lack mitochondria have been found to contain mitochondrion-derived organelles, such as hydrogenosomes and mitosomes; and thus probably secondarily lost their mitochondria. Plants and various groups of algae also have plastids with their own DNA and, like animals, are accepted to have developed from endosymbionts, in this case cyanobacteria. They usually take the form of chloroplasts, which like cyanobacteria contain chlorophyll and produce organic compounds (such as glucose) through photosynthesis. Others are involved in storing food. Although plastids likely had a single origin, not all plastid-containing groups are closely related. Instead, some eukaryotes have obtained them from others through secondary endosymbiosis or ingestion. Ciccarelli FD, Doerks T, von Mering C, Creevey CJ, Snel B, Bork P (2006). "Toward automatic reconstruction of a highly resolved tree of life". Science 311 (5765): 1283–7. Cavalier-Smith, T. (1998). "A revised six-kingdom system of life". Biological Reviews of the Cambridge Philosophical Society 73 (3): 203–266. Cavalier-Smith, T. & Chao, E.E. (1996). "Molecular phylogeny of the free-living archezoan Trepomonas agilis and the nature of the first eukaryote". Journal of Molecular Evolution 43 (6): 551–562. Cavalier-Smith, Thomas (2002). "The phagotrophic origin of eukaryotes and phylogenetic classification of Protozoa". International Journal of Systematic and Evolutionary Microbiology 52 (2): 297–354. Fabien Burki, Kamran Shalchian-Tabrizi, Marianne Minge, Åsmund Skjæveland, Sergey I. Nikolaev, Kjetill S. Jakobsen, Jan Pawlowski (2007). "Phylogenomics Reshuffles the Eukaryotic Supergroups". PLoS ONE 2 (8): e790. Porter, Susannah H., Meisterfeld, Ralf, and Knoll, Andrew H. (2003). "Vase-shaped microfossils from the Neoproterozoic Chuar Group, Grand Canyon: a classification guided by modern testate amoebae". Journal of Paleontology 77 (3): 409–429. Thomas Cavalier-Smith (2006). "Protist phylogeny and the high-level classification of Protozoa". European Journal of Protistology 39 (4): 338–348.